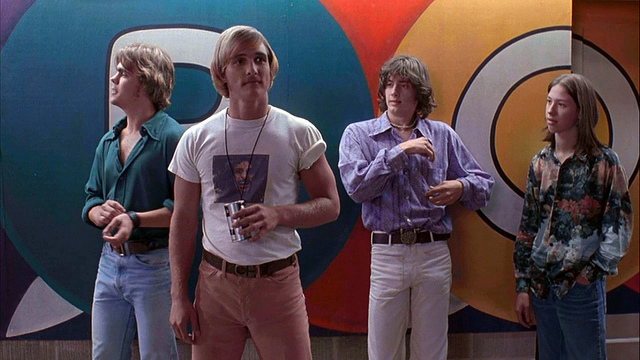 Those not familiar with the teen culture of the time may not appreciate the magic of a place like Emporium in Richard Linklater’s teen comedy “Dazed and Confused”. Long gone are the days of small town teen hangouts but at the time cruising and hanging out on a Friday and Saturday night were a key part of a teenagers social experience. Often times a place like Emporium served as the central hub that brought everyone together. In “Dazed and Confused” Emporium is bustling with life. Loud music fills the building and only the laughter of the young patrons is louder. It’s also where the cooler older kids hang out, something the underclassmen know all too well. Pool tables, fuzzball, and jukeboxes keep the kid’s attention but it’s the social interaction that makes a place like Emporium so special. Linklater perfectly captures this lost period pleasure that many from the 1950s all the way to my generation in the 1980s remember well. Who wouldn’t love to hang out at Emporium? The Cue Ball on Main Street or Bob’s on Valley. Thanks man. There is a big hint of nostalgia that I feel whenever I watch it. I guess it’s because I remember the 80s version of that time period. Those timeless words. And it was at Emporium that MM uttered that great line about high school girls! LOL! Our handout was The Mad Butcher parking lot and the local Sonic was the drive-in (or drive-around). I never got into the smoking thing and it almost had a stigma attached to it by the mid to late 80s. But everybody hung out and that was a staple of every Friday and Saturday night. Nice one, man. I caught this one recently again and it just never gets old. Fabulous film!! You said it best. It never gets old. And every scene at the Emporium is great. I still need to see this movie, Keith! It’s a little coarse but there is such a Linklater realism to the whole thing.